Trying to vacation in Las Vegas and stay on a budget? Take a BITE out of your Las Vegas dollars with the ultimate Las Vegas discount card. The Vegas Bite Card offers you the deepest discounts on many shows, tours, attractions, restaurants and quick bites in Las Vegas.You will have unlimited use with your card for your entire Las Vegas vacation. The card is good for 1 year so you can use it over and over again on your next trip to Las Vegas. The savings are astronomical - save hundreds of dollars! 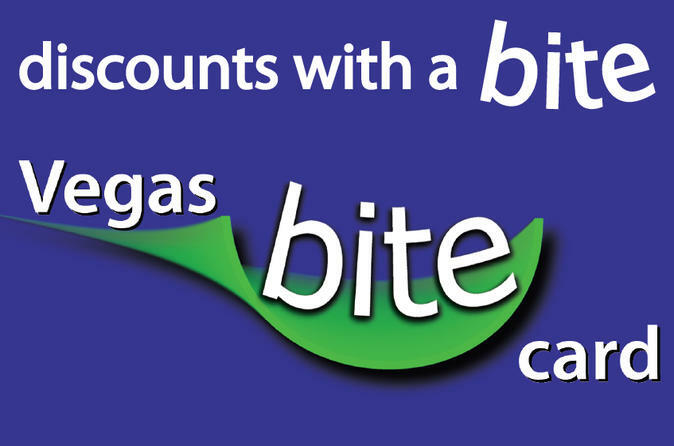 There are no coupons required, just show your Vegas Bite Card and get your discounts at many locations along the Las Vegas Strip. Beatleshow, Defending The Caveman, V-The Ultimate Variety Show, Popovich Comedy Pet Theater, Hitzville Motown Review, Carrot Top, Laugh Factory, All Shook Up, Legends in Concert, LA Comedy Club, The Mentalist, Mat Franco and Marc Savard Comedy Hypnosis, Marriage Can Be Murder, Raiding the Rock Vault, MJ Live, Nathan Burton Comedy Magic, Marvel Avengers Station, George Wallace, Gordie Brown, David Goldrake's Imaginarium. Discounts for Maggiano's, Cabo Wabo Cantina, Hash House A Go Go, Blondies Sports Bar & Grill, Hofbrauhaus, Ketchup, Origin India, RiRa Irish Pub, Haagen Dazs, Dreyers, Ben & Jerry's, Blue Martini, San Gennaro Grille, Pampas Brazilian Grille, Osaka, Nathans, Johnny Rockets, Bonannos New York Pizzeria, Original Chicken Tender, LA Subs, Great Wraps, Pan Asian Express, Nestle Toll House Cafe, Haute Doggery, Curry Pot and Marche Baccus French Bistro & Wine Market. Save $50 on your wedding! Special Offer - Book and save 14% compared to the local supplier's prices! - Book Now!